A disease model is an animal or cells displaying all or some of the pathological processes that are observed in the actual human or animal disease. Studying disease models aids understanding of how the disease develops and testing potential treatment approaches. It requires the use of disease-specific pluripotent stem cells as the starting materials for generating surrogate models of human disease. Pluripotent stem cells are the cells which are capable to differentiate into any kind of cell type. They are also known as ‘True stem cells’. So, it is possible to model a disease in a dish which allows a pathophysiological insight of that disease and better ways to cure one. Bioinformatics plays an important role in disease modeling as it makes easy to tarce the pathway of pathogens inside the organism and also helps in study the gene or protein responsible for the disease and many such ways. Eiges et al. (2007) were first to make and derive novel early developmental information from disease-specific pluripotent stem cells. Human disease specific pluripotent cells could be made only by genetic modification of existing human embryonic stem cells (hESCs) or by the generation of new hESCs from embryos carrying those monogenic diseases detectable. The advent of induced pluripotent stem cells (iPSCs) has transformed the prospects for disease modeling. The iPSCs are kind of Pluripotent stem cells which can be generated directly from adult cells. iPSCs can be made with cells taken from babies or adults of all ages with full medical records and suffering from virtually any genetic disease, whether simple or complex. Cells can be taken from a living patient or a frozen tissue bank then these tissues are used to generate iPSCs. Differentiation of the chosen pluripotent cell type into the target cell type(s) of choice is then performed. If possible, such cells should be compared with similar cells taken from a patient (ideally the somatic cell donor), even if the main target of a particular study is a much earlier appearing progenitor. This is the ‘‘reality’’ check which is done because it can validate the fidelity of in vitro differentiation. iPSCs can be either obtained by the isolation of ESCs (Embryonic Stem Cells) from preimplantation diagnosed embryos, or by genetic modification of existing hESCs, hiPSCs, or somatic progenitors. Differentiation of these pluripotent cells is to study the emergence of the disease phenotype in vitro or be used for drug screening or development. On the basis of the results obtained from differentiation of the PSCs, the modifications are made to get a desired function in the cell or to develop a desired drug or personalized medicines. Fig. 1. 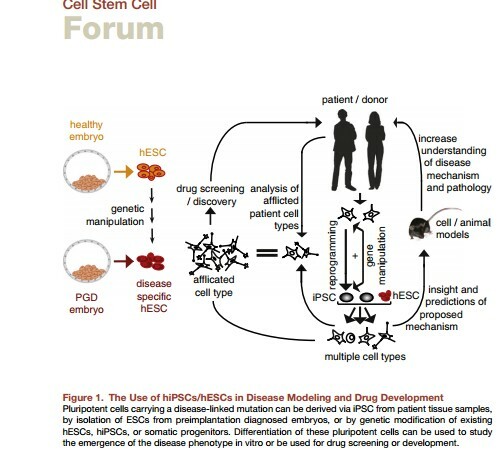 The Use of hiPSCs/hESCs in Disease Modeling and Drug Development Pluripotent cells carrying a disease-linked mutation can be derived via iPSC from patient tissue samples, by isolation of ESCs from preimplantation diagnosed embryos, or by genetic modification of existing hESCs, hiPSCs, or somatic progenitors. Differentiation of these pluripotent cells can be used to study the emergence of the disease phenotype in vitro or be used for drug screening or development. Disease modeling acts a synthetic system to study the pathways of diseases to make up the unknown causes of various diseases. For example, Spinal Muscular Atrophy (SMA) was studied by Ebert et al. (2009). Spinal muscular atrophy (SMA), an autosomal-recessive disorder, is caused by mutations in the SMN1 gene that lead to reduced SMN protein levels. This loss leads to selective decreased generation of alpha motor neurons at a very early age (around 6 months) with death following around 2 years of age. They made iPSCs from the fibroblasts of a SMA patient and his unaffected mother. Less SMN protein was seen in the iPSC(SMA), and after motor neuron differentiation of the two iPSCcultures, smaller numbers of mutant motor neurons accumulated on prolonged culture. SMN levels in iPSC(SMA) and derived motor neurons could be increased by addition of the drugs valproic acid and tobramycin. Next Story Next post: What is Numerical Taxonomy? How is it useful?